The UI has its own API. This can be used to do some simple operations, if you want to create your own simple dashboard, instead of using our awesome spectacular UI. 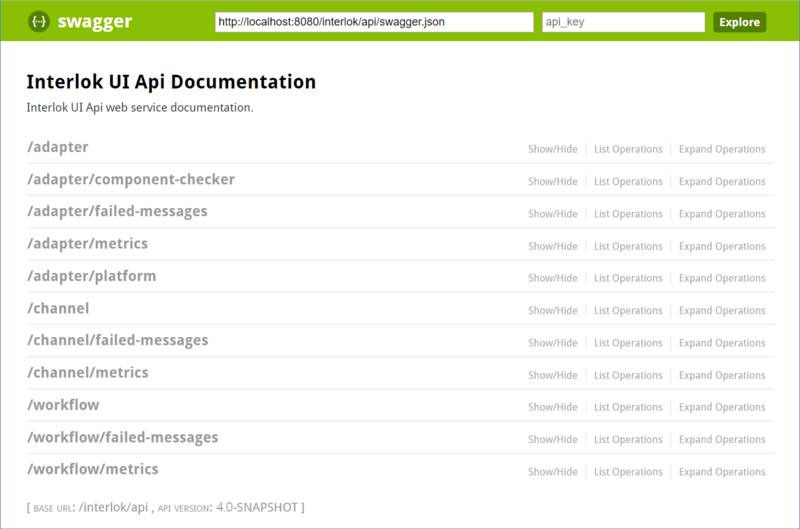 For a complete descriptions of all the possible operation with the API please have a look at UI API Swagger Documentation. The Interlok UI API is accessible via restful web services. The best way to learn how to use the Interlok UI API is to use Swagger UI. You can see all the available operations by using it. Learn more about Swagger and Swagger UI. Once you’ve downloaded Swagger UI you should copy it into the adapter/webapp folder. You should be able to access it via http://localhost:8080/swagger-ui-2.1.4/dist/index.html (where /swagger-ui-2.1.4/dist/ is the name of the folder you copied into adapter/webapp). The default API url in Swagger UI is a pet store example. 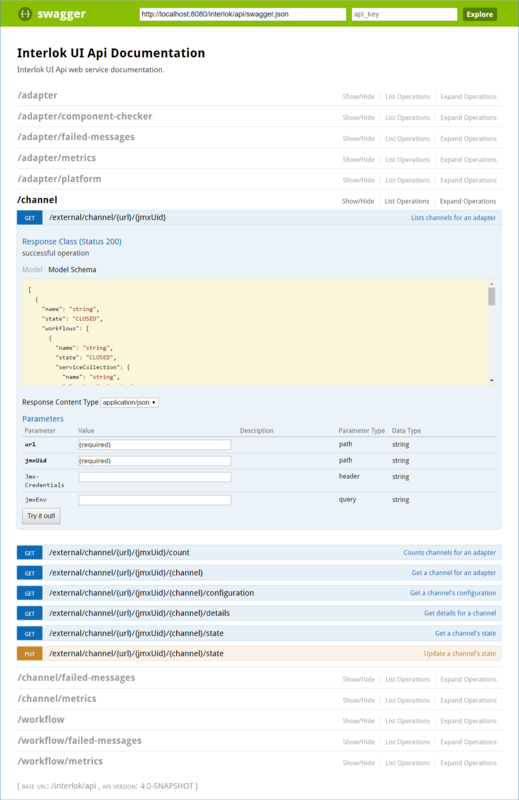 Replace it with it the Interlok UI API url http://localhost:8080/interlok/api/swagger.json. "title" : "Interlok UI Api Documentation"
Back to the Swagger UI, you should get a list of all the Interlok UI API operations e.g. All the Channel and Workflow api urls up to version 3.6.3 are deprecated. Adapter api urls are still valid. This section aims to help understanding the most used api parameters. 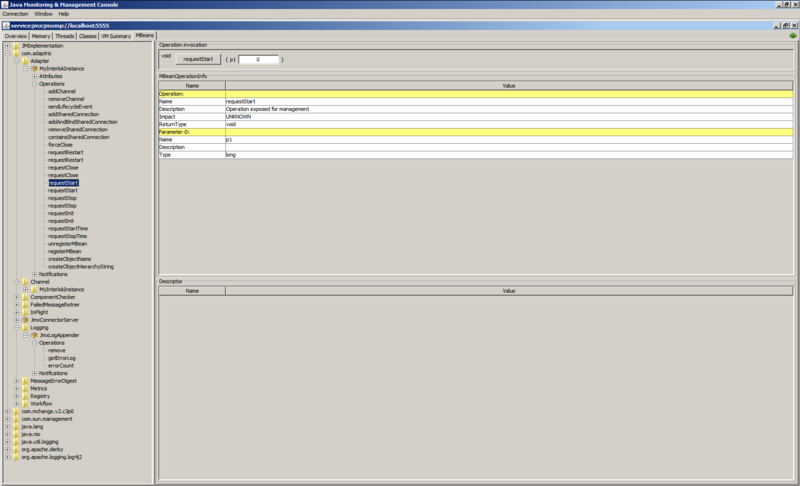 adapter: Path parameter corresponding to the Adapter database id. You can also use ‘local’ to work with the UI local adapter. jmxUid: Path Path parameter corresponding to the unique identifier used in the Adapter configuration XML. Used with the url parameter. Jmx-Credentials: Header parameter corresponding to the Adapter JMX credentials. Only use this if the jmx connection has been configured to use credentials. jmxEnv: Query parameters corresponding to the Adapter JMX environment parameters. channel: Path Path parameter corresponding to the Channel unique id. workflow: Path Path parameter corresponding to the Workflow unique id. There is a working example of the UI API in action within the cm-dashboard project (the Cirrus UI). This manage Interlok container page is using the interlok ui api to obtain data & perform functions on this selected Interlok container. All the Interlok containers in this community are registered with one ui Interlok container, which is having the ui api accessed by this webapp. In essence, this page is its own Interlok container ui. Of course, you can use Interloks own MBeans to gain data and operate functions.